Work began last week on the demolition of the Regal Cinema on Tamworth Street in the centre of Lichfield. Machinery arrived at the rear of the building facing Cross Keys on Wednesday [25 July 2018], the site was fenced off, and the demolition work began on Thursday. For some people in Lichfield, the former cinema has been an eyesore for years. But for others, the Regal Cinema this was an important part of their memories from childhood and teenage years. The demolition comes as a surprise, if not a shock, to many, not only because of those cherished memories, but because the Regal Cinema has long been listed for its Art Deco frontage. The developers promised last week that this façade will be saved and incorporated into the new building. 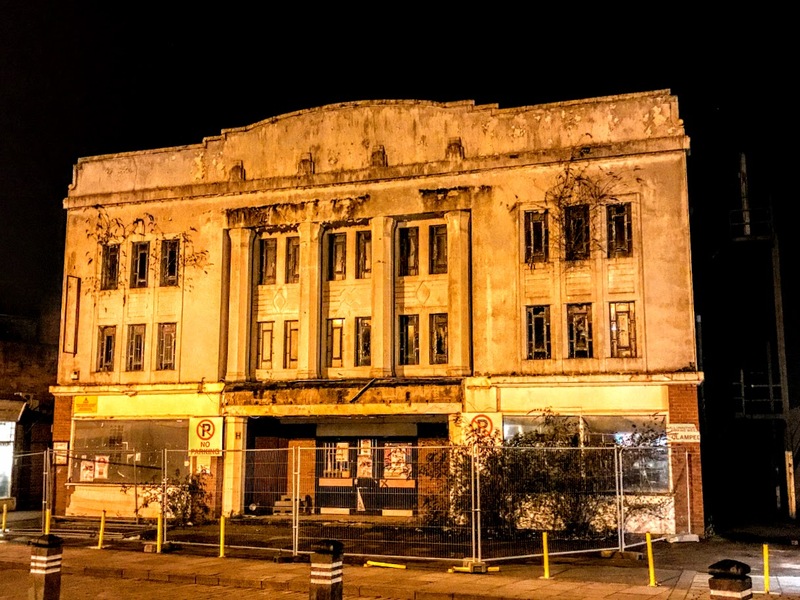 Richard McGarry of PBM Contractors Ltd told the Lichfield Mercury: ‘The listed façade is staying but the rest of the building is coming down. The Art Deco style cinema building in Tamworth Street has been lying empty for more than 10 years. During the past decade, the once-handsome frontage has deteriorated, vegetation has been growing from the windows and it has become increasingly shabby in appearance. The Regal Cinema opened at 23-27 Tamworth Street 86 years ago, on 18 July 1932, and it operated for more than four decades until it closed in 1974. The building reopened some years later as a KwikSave supermarket. But the supermarket closed in July 2007 when KwikSave went into administration. Since then, numerous development plans were put forward for the site, including hotels and restaurants, but none of these came to anything. The latest plan, approved in February 2017, was for the demolition of the building, the retention of the 1930s façade and the construction of 38 apartments and a shop unit. Five years ago, in a feature in the Lichfield Gazette [August 2013], I wrote how The Economist had published a news story about the Louxor Palais du Cinema, north-west of the Gare du Nord in Paris, which was once one of the jewels of Egyptian-inspired art deco. It opened in 1921, boasting pillars, papyrus motifs and pharaohs’ heads – and with an auditorium that could seat almost 1,200 people. In its report The Economist recalled that this was the heyday of silent movies of the sort that The Artist brought back to life. However, after World War II, the cinema fell on hard times, and the Louxor screened its last movie in 1983 before Pathé sold the building to a retail firm that had plans for a store. However, those plans never saw the light of day because the Louxor’s exotic façade had been listed for preservation. From 1987 on, the building stood empty. Two pressure groups were formed in 2001 to regenerate the Louxor and to raise the tone of the neighbourhood. Paris City Hall bought the site, work began on restoring the Louxor to its original glory, and three years and €25 million later, the Louxor re-opened with Grandmaster, a Chinese martial-arts movie, as its first showing. At the time, I thought this news must surely offer hope and inspiration to people in Lichfield who were campaigning to save the Regal Cinema. The Regal Cinema opened in Lichfield on 18 July 1932 with Maisie Gay in The Old Man and Shirley Dale in The Beggar Student. It was designed by the Birmingham-based architect Harold Seymour Scott (1883-1946), who was also a director of the independent operating company. Scott designed many cinemas in the Midlands in the Art Deco style in the 1920s and 1930s, including the Oak in Sell Oak and the Piccadilly in Sparkhill. But most of these have been demolished or destroyed in fires in recent years, and until last week the Regal in Lichfield was one of the few still standing. Like the Louxor in Paris, the external and internal styles of the Regal were described as a ‘delicate’ Egyptian, Art Deco style. There was seating in the auditorium for 1,300 people, with 1,000 people in the stalls and another 300 in the circle. The proscenium was 40 ft wide, and the cinema also had its own café. By November 1932, the cinema had been leased to the County Cinemas chain. It was taken over briefly by the Oscar Deutsch chain of Odeon Theatres Ltd in September 1939, but it was back in the hands of the original independent owners by around 1941. In August 1943, it was taken over by the Associated British Cinemas (ABC), and this chain operated the Regal Cinema until July 1969. The Star Cinemas chain then took over. Part-time bingo was introduced on several nights a week, and on 10 July 1974 the Regal Cinema screened its final film, Bruce Lee in The Big Boss. The Regal then became the Star Bingo Club. The building was sold in the late 1970s, and became a KwikSave supermarket, with a snooker club in the former café area. By 2008, the building was ‘For Sale’ or ‘To Let’ for leisure use. Proposals to demolish the auditorium and to build a hotel on the site, retaining the Regal Cinema’s façade as the entrance, were put forward in February 2010. Planning consent was granted for the partial demolition and new build of the premises to create a bar and restaurant and a 104-bedroom hotel, with associated facilities. However, in the years since then, no work was carried out on the proposed hotel, and the vacant building continued to deteriorate. In 2012, Anna Coley had started a Facebook page, ‘Restore the Regal Cinema, Lichfield!’ Around the same time, Adam Bradley organised a petition for the restoration of the Regal Cinema ‘to its former glory.’ By the time the petition closed, it had been signed by more than 80 people. However, the Friarsgate Scheme collapsed last month. Nor was the argument ever simply about the need for a cinema for Lichfield and the surrounding catchment area. It was also about the conservation of a unique and beautiful building that has been part of Lichfield’s architectural heritage for almost a century. Despite uncertainty about the future of the Regal, it was included by the historian and journalist Joss Musgrove-Knibb, editor of CityLife Lichfield as No 21 in her indispensable book, Lichfield in 50 Buildings (Stroud, Gloucestershire: Amberley, 2016), with a photograph by her husband, Carl Knibb. If this was a Tudor-era cinema in Bore Street, a Georgian-era cinema in Bird Street, or a Victorian-era cinema in Beacon Street, the case for its preservation would have been quite clear. Why is art deco architecture less valued because it only dates from the 1930s? 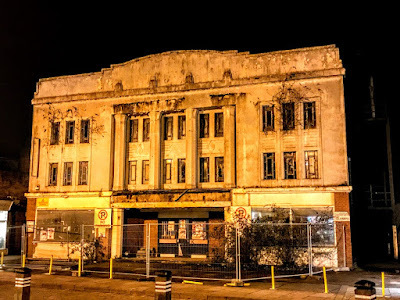 The blogger Brownhills Bob has pointed out that the Regal was the only Art Deco building left standing in Lichfield since the Robin Hood on the corner of Saint John Street and Frog Lane was demolished. It was also built in the 1930s, replacing an earlier pub dating back to the 1790s. In his book on The Old Pubs of Lichfield (2001/2007), John Shaw recalled the names changes it went through, including City Gate, City Frog and Funky Frog, before being demolished in October 2000 to make way for new apartments on the site. Part of the Art Deco Burton building at 26 Market Street dates from about 1938, when the foundation stones were laid, but the ground floor has since been replaced with later shop-fronts. Two films – The Greatest Showman and Pretty Woman – are being screened at a pop-up, open-air cinema in Beacon Park next month [10 and 11 August 2018]. But, while the former Civic Hall frequently shows films and movies are occasionally billed as part of the Lichfield Festival, the city has remainedwithout a permanent cinema since the Regal closed.